You have a server, a raspberry pi, a cloud instance or something else running on Linux and you want to follow your Logs, the easy way? You have never installed a log collector and you're new to Graylog? In this guide will show you how to send Logs from your Linux instance to Logs Data Platform. Don't be afraid, it will be easier than you think. On Linux, logs are generated automatically, for a variety of actions. RAM usage, file downloads, login attempts, network failure, ... almost everything. But logs can be difficult to read without proper tools. With this platform, you'll be able to sort logs and create fancy dashboards. Conclusion : lot of info, with a date, a process, a description. but hard to follow. First thing to do is to configure your Logs Data Platform account: order a plan (we have free plans ;-), create your user, a stream and a dashboard. Verify that everything works already perfectly. We wrote an independent guide for this, please read it and come back here after : Quick start Good? let's go to following step then ! So let's assume you have your Linux. This guide DOES NOT fully cover how to configure other flavors of syslog nor other OSs. Please refer to their own documentation to know how to setup a template and a external destination for the logs. You can still read this entire document to have a grasp on how the template is built. However this configuration should work on any syslog-ng version above 3.8. We will install a log collector. What's this? It's a tool that collects logs from any source, processes them and delivers them to various destinations, like the Logs Data Platform. Check that your syslog-ng version is above 3.8 (use syslog-ng --version) for that. Copy-paste this configuration. Don't forget to modify the token value and the LDP cluster by yours. ## Bracket  no space between inside (opening/closing), space outside. ## sid_id (exampleSDID@32473), flowgger need an id for structured data as specified by the RFC 5424. If you push your syslog-ng logs to one of your dedicated data gathering tool, you will need to perform an extra step. Copy the data-gathering tools certificate from the manager Home page in SSL Configuration section, and paste it in file "/usr/local/share/ca-certificates/ldp.pem"
SOURCES : this is the logs sources to collect. So here, we collect System and Internal. More sources can be added of course! DESTINATION : This is where we will deliver logs in nearly real time. Here, we have to destinations : The first is the remote endpoint in Logs Data Platform, the second one is local. Retrieve the correct endpoint for RFC 5424 by going to your manager and head to the Home page. I create a new log file locally in order to check if the logs are properly sent. It's optional of course, and you can safely remove it once everything is fine. as you can see, the remote destination will use the template, the local destination will not. It means syslog-ng has started up, and connection to remote endpoint is fine. Connect to the Logs Data Platform manager, ensure you that you have a Stream and that the token in the syslog configuration file is OK. Ensure that you have a Dashboard created. 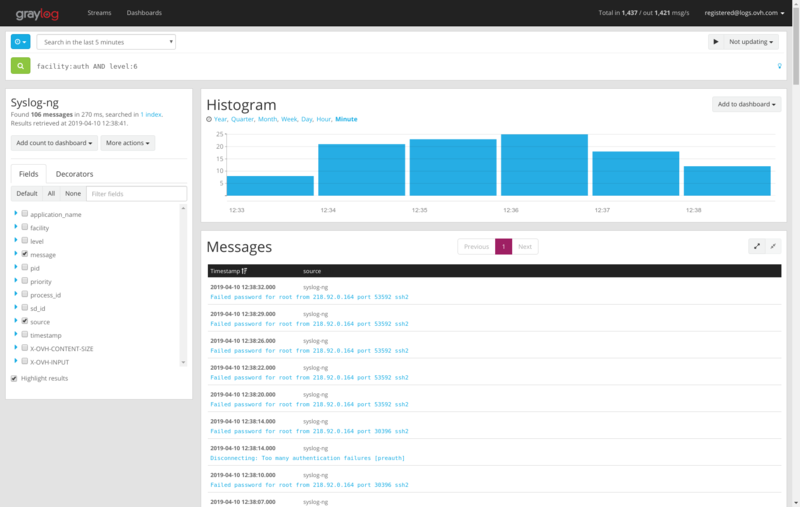 Head to your stream by using the button Graylog access located in the ... menu of your stream, or head directly to the graylog access of your cluster. Once in Graylog, Go in Stream Tab, click on your stream. In the top-left corner, chose a 1 Day range and click on the green button to search. On the top right corner of the histogram, click on Add to dashboard. On the left, click on the small blue triangle before "facility"
Well done, second Widget added! The best feature is to mix criteria, based on what is important to you. For example, facility:auth AND level:6. Also you will soon be able to create Alerts in Logs Data manager.